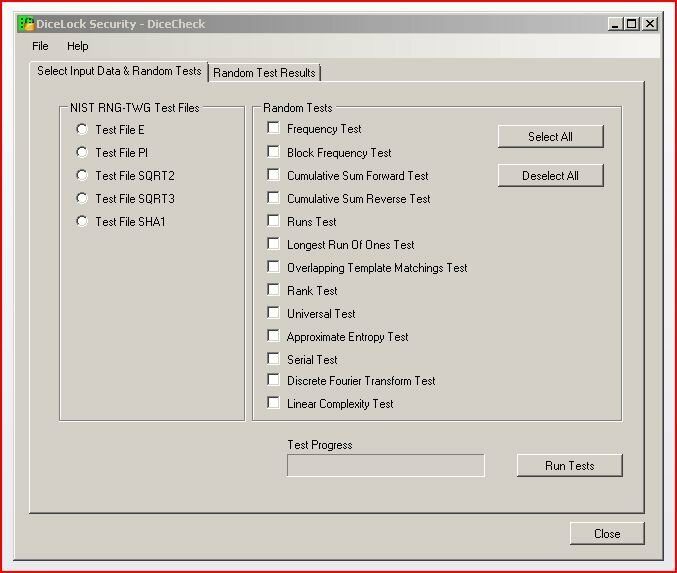 FREE DiceLock Security DiceCheck GUI and DLL Library - Incorporate random number tests in your applications. The C++ library contains classes implementing Frequency Test, Block Frequency Test, Cumulative Sum Forward Test, Cumulative Sum Reverse Test, Runs Test, Longest Run Of Ones Test, Rank Test, Universal Test, Approximate Entropy Test, Serial Test, Discrete Fourier Transform Test. ...... The C++ library contains classes implementing Frequency Test, Block Frequency Test, Cumulative Sum Forward Test, Cumulative Sum Reverse Test, Runs Test, Longest Run Of Ones Test, Overlapping Template Matching Test, Rank Test, Universal Test, Approximate Entropy Test, Serial Test, Discrete Fourier Transform Test, Linear Complexity Test. DiceChecker 5.0.0.1 is able to share the data with HashDigester 5.0.0.1 hash algorithm product. - added default block lengths to BlockFrequencyTest, ApproximateEntropyTest and SerialTest classes of DiceChecker DLL. Qweas is providing links to DiceCheck 5.0.0.1 as a courtesy, and makes no representations regarding DiceCheck or any other applications or any information related thereto. Any questions, complaints or claims regarding this application DiceCheck 5.0.0.1 must be directed to the appropriate software vendor. You may click the publisher link of DiceCheck on the top of this page to get more details about the vendor.